Feel like your skin is looking a little blah lately? 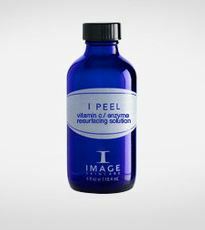 At IMAGE Skincare, we offer eight high-end peels that are sure to whip it into shape. These products range from non-chemical peels to ones that are professional medical grade level. So whether you are looking for an intense skin makeover, or just a little pick me up, we have the perfect product for you! Each of our products has been created with certain key ingredients to target specific skin problems. For instance, our Vitamin C/Enzyme Resurfacing formula includes Vitamin C and green tea, which are anti-oxidants that can wake up that tired and dull skin. Then there is Image Skincare’s OrMedic Passion Peptide Peel, which contains soothing organic aloe vera and is designed for sensitive skin or for pregnant women (after consulting with a doctor of course). On the other hand, Image Skincare’s Glycolic/Retinol and Lactic/Kojic resurfacing facial peels are aimed for women who may need a little stronger product. Glycolic/Retinol, for instance, is designed to reduce wrinkles and contains Bearberry, a skin lightener. Lactic/Kojic contains, of course, the two ingredients that make up its name; both of which are designed to exfoliate and lighten rough-looking skin. At Image Skincare we also offers our clients four products — Salicylic, Salicylic/Glycolic, and Salicylic/Lactic/Retinol — that contain salicylic acid and are designed especially for problem or oily skin. The latter product also contains retinol, which is an effective anti-aging ingredient. Image Skincare’s TCA Orange Peel-RX also contains salicylic acid but is designed for skin with pigmentation problems or sun damage. To help your skin really glow, make sure to include an anti-aging serum into your skincare regiment, such as Image Skincare’s Ageless Total Anti-aging Serum.